Artists travel from all over the world to paint in the pure ambient light of New Mexico. But it was native son Federico Vigil who depicted the history of the Land of Enchantment in an epic buon fresco illuminated only by that natural light. 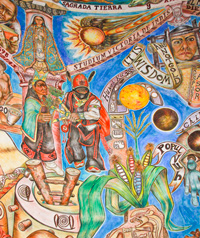 His masterpiece is a 4,000 square foot mural on a domed ceiling and concave wall in a 45-foot high Torreon at the National Hispanic Cultural Center near downtown Albuquerque. For some, the feeling upon first entering the south-facing door is breathtaking and when you leave you know in your heart, mind and soul that you have taken a journey to the source of the New World. For others, the majesty of the work is equally satisfying and since there is no artificial light, plan your visit for midday. Vigil’s pedigree includes having fought the good fight for Chicano civil rights, and his hands show years of working with plaster and natural paint pigments from all over the world. Soft- spoken and courtly, he is very knowledgeable about the art form he has chosen to pursue, which has taken him to both sides of the Atlantic. Vigil was trained by protégés of the famous Mexican fresco artist Diego Rivera. His teachers, Lucienne Bloch and Stephen Pope Dimitroff, had been assistants to Rivera in the 1930s. After having participated in the creation of an exterior acrylic mural in Santa Fe, Vigil noticed how quickly it faded and in 1984 was happy to accept a fellowship to study the ancient art of buon fresco in Gualala, California with the couple. Buon fresco is a process of plastering, drawing and painting on wet walls. It is a form that requires huge cartoons to be dusted on to the wet plaster before painting in very small sections. The home of the Torreon is the National Hispanic Cultural Center (NHCC). After all the rabble rousing of the Chicano generation in the 1960s, many Hispanos who became successful realized the community had little to show for their contributions. An idea sprouted among these now successful men a generation ahead of the revolutionaries. Many of them had served in WW II and were now doctors, lawyers, politicians and businessmen. What followed were many years of fundraising and political maneuvering to finally build the NHCC with a combination of private and public money. The NHCC is not anywhere near an art gallery, but rather in a historic barrio along the Rio Grande known as Barelas. It sits on 51 acres, has three performance theatres, a magnificent art museum with four galleries connecting and fully loaded with digital and audio capabilities, a genealogy research center, a library, classrooms and the Cervantes Institute, a partnership with the Government of Spain which has Spanish professionals helping bilingual education teachers locally. Ed Lujan, a founding member of the NHCC and a beloved elder in the community, wanted to have Vigil’s talent showcased at the center. Lujan, the brother of the former Congressman Manuel Lujan (R-NM), realized that the Torreon, built as an information center, was the right place for Vigil’s talent. To insure historic accuracy, Vigil enlisted the help of published scholars and experts on Spanish, Mexican and Southwest history to insure that his content was historically correct. The panorama of history includes the Phoenicians who traded with Spain, the Conquistadors who came to the New World, and the MesoAmerican empires they encountered. The fresco also annotates dates and images important to Latino history across all cultures. In 500 years when this mural is being examined to understand who we as Latinos are, the examiner will get a very good picture. One must remember that this is still, next to cave drawing, one of the oldest and most labor-intensive forms of painted art in the world. Vigil had to work on a domed ceiling and curved walls, which required complex engineering to get the right perspective. The task was daunting, often back-breaking and always slow. For Vigil, it is a living work of art. When he talks about the walls he talks about them breathing. His images are embedded in the wall and these walls aren’t going fade. This Vigil fresco will live on like all the famous frescos in the world and it sits in New Mexico. Disagreements over blood, ancestry, who came when, and to do what, boiled up to the surface as the images were being developed. When some complained about the imagery in the fresco leaning toward the Native Pueblo, Apache and Comanche cultures, Vigil stood firm as an oak and through his sheer artistic vision has kept his imagery on those precious walls as pure to its origins as humanly possible. Maria Elena Alvarez is a writer and photographer living in Albuquerque, New Mexico.